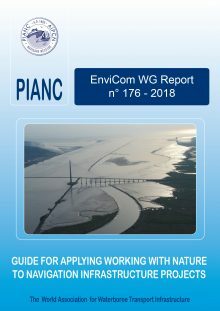 PIANC’s Working Group 176 (Guidance on Applying Working with Nature to Navigation Infrastructure Projects) was tasked with preparing guidance that raises awareness of natural ecosystems, inspires the navigation infrastructure community to embrace natural systems design and promotes expanded acceptance of the Working with Nature (WwN) approach by providing a selection of case studies to illustrate how WwN applies to navigation infrastructure projects and identifies associated tools, steps and practices. WwN offers a framework to design new infrastructure or rehabilitate existing infrastructure in a way that works with natural processes. This approach serves to enhance ecosystem viability and resilience and minimise negative anthropogenic impacts to the environment.